After GDW closed its doors, Marc Miller -- who is to Traveller as Gygax was to D&D -- secured the rights to the game system. 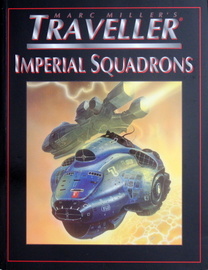 He authorized this ill-fated rewrite of Traveller by Imperium games (also known as 4th Edition Traveller). During its two year run, the company published two dozen books, detailing "Milieu 0." 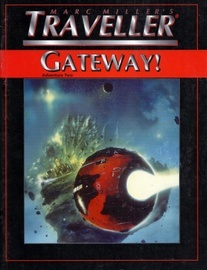 Many players felt that Traveller had gotten out of control, and away from its roots during the MegaTraveller and Traveller: The New Era phases. Milieu 0 takes play back to the founding of the Third Imperium, a time of rebuilding after "The Long Night." T4 was poorly received for several reasons. The first strike was the anemic state the RPG industry had fallen at the time, with declining sales and the shake-up that had claimed GDW and others in the last half of the 1990s. By 2000, Wizards of the Coast and Steve Jackson Games would emerge as industry survivors with their flagship D&D D20 and GURPS systems, respectively. That said, the writing quality of the series is generally good, and I collect the accessories just for the background information. 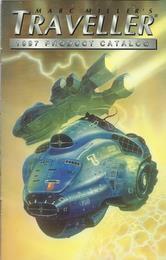 I really enjoy the striking Chris Foss cover art, and the interior line drawings by Larry Elmore. A surprising highlight of the rulebook is all the interior Larry Elmore sketches. Each of the classic Traveller ships gets two pages of stats, sketch, and deck plans. 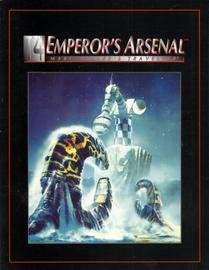 Also includes a ship design system and color plates of great Chris Foss art. A dozen aliens detailed: Asym; Bye-Ren; The Controlled; Denaar; Graytch; Hana Saka; Hresh; The Newts; Nunclees; The Providers; Tekundu; Trakii. Milieu 0 actually comes in two distinct versions: An earlier softcover, and a deluxe hardcover compilation adding 4 new chapers, and incorporating previously published First Survey. 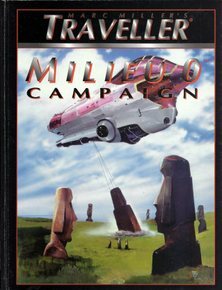 "Traveller's campaign world is revealed! The Long Night, a period in which the remnants of a once-mighty interstellar empire regressed to barbarism, has passed. Starships once again ply the space lanes, and civilizations are reawakened to the vast interstellar community of worlds. One ambitious world has designs on empire itself, and the growth of the Sylean Empire is in full swing. It is the time of the pocket empires, despots and philosophers, merchant princes and piratical tyrants, an age when the foundations of the next thousand years of history is being laid. Milieu 0, the dawn of empire is at hand! 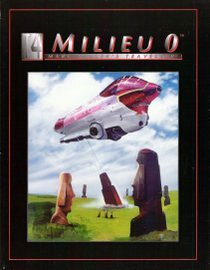 Milieu 0 Campaign opens the era of Traveller play, showing the referee how to begin and maintain an epic game where his players can ride the waves of unfolding history." "With the establishment of the Third Imperium, the strong economic forces that created it continued their work by driving an outward expansion by the Imperium into neighboring worlds. 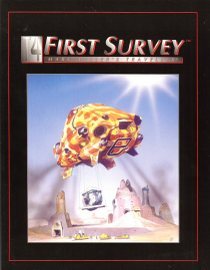 This survey book is intended to serve two distinct purposes: a reference work and as an adventuring log." Contains Traveller UWP information for nine sectors, backdated to the Year 0. "Welcome to the Inaugural Edition of Carnak's Surface Weapons. 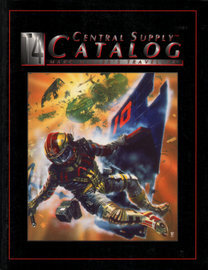 This is the first of several known space databases, which are the definitive yearly reference to Sylean, Imperium and non-Imperium hardware of all kinds, including Carnak's Jump and System Ships, Carnak's Surface Transports, Carnak's Sensors and Communications and Carnak's Ship Support Systems." "The new Imperium is growing, reaching out to neighboring worlds after the Long Night, expanding in power and influence. Some of the worlds they contact are already part of smaller empires, Pocket Empires, also rising from centuries of barbarism. 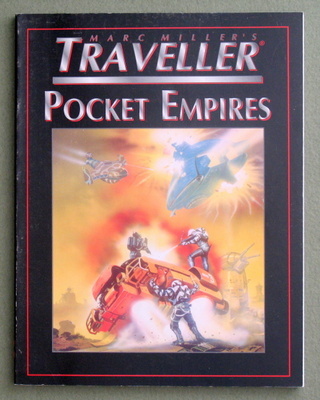 Pocket Empires presents complete rules for players to own and manage Traveller worlds. Generate income from worlds, assessing each for resources, labor, trade and technology, then allocate revenue to build infrastructure, space fleets, and more! Set interstellar economics in motion." "Take an adventurous odyssey among the star systems of the growing Imperium. Wander the systems of Core sector, discover the secrets of a strange, psionic, child, enter and explore a research station, and confront the many mysteries of worlds of humans beneath other suns. 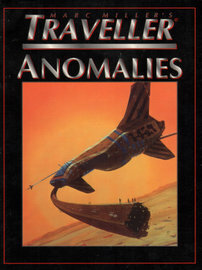 Anomalies sets the stage for nine exciting adventures for Marc Miller's Traveller set in Milieu 0. Play them individually, or put them together to create a long-term, fascinating Milieu 0 campaign!" "The beginning days of the new Sylean empire are a time of open acceptance of psionic powers and those who have them. Institutes range in size and reputation from established universities with influence at the highest levels to fly-by-night charlatans and basguat-oil salesmen that keep one step ahead of the authorities. Psionic athletes compete in games and are admired across the star systems. 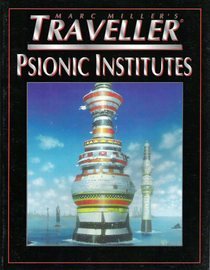 Learn about the early Psionic Institutes and how to integrate them into your Traveller campaign." 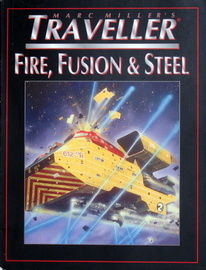 "Completely updated and integrated into the T4 edition of the Marc Miller's Traveller game, Fire, Fusion & Steel is the comprehensive vehicle design system. Everything from ground cars to grav tanks, system patrol boats to atmospheric cruisers, the rules let you design each vehicle down to the last detail to suit your adventurers or your campaign. 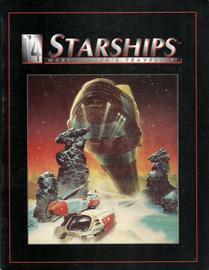 The most realistic, comprehensive vehicle and equipment design system ever published for science-fiction role-playing!" "The Imperium's armed and civilian forces rely on a stable of standard vehicle designs, conveyances and armed craft found on many worlds. 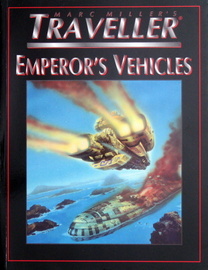 Emperor's Vehicles has dozens of vehicles for land, air, and ocean adventuring. Every vehicle category is illustrated and described for easy integration into your Traveller campaign. Ride the best technology the Imperium has to offer!" "Deck plans for Traveller campaigns. Ideal for any adventure situation, Naval Architect's Manual provides hundreds of deck plan elements to represent any starship, base, orbital station, or starport. Take command on one of the bridges, break out of the brig, or relax in the holo lounge. Now you've got all the deck plans you need for any adventure! Every section is accompanied by description and exciting role-playing suggestions." "Fleets of starships vie for dominance among the pocket empires and the growing Sylean Empire. Imperial Squadrons sets the stage for Traveller play on the flagships of enormous space fleets, drawing resources and conquering worlds. Complete guidelines for role-playing while still in the service, adventuring in the midst of battles that decide the fate of millions!" "Missions of state are selected adventures geared to the complexities of intercultural intrigue. Nine adventures pit noble characters against formidable odds, moving among the Imperium's elite, all the while using their privileged rank to delve into intelligence gathering and espionage. With the emergence of empire come new challenges to the status quo, and power is there for anyone to grab! 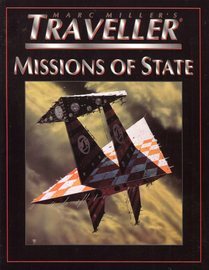 Missions of state is an excellent set of adventures for any Milieu 0 campaign." "The mission: A covert reconnaissance deep into uncharted territory beyond the borders of the new Sylean empire. But that mission is quickly disrupted as the adventurers jump out of system in their extended-duration survey class Scout ship. Only skill and determination will see the crew safely home through the perils of unexplored space. 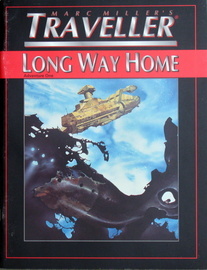 The Long Way Home is a complete adventure for Marc Milller's Traveller, set in Milieu 0. Each section of the adventure is presented in the easy-to-play nugget format, complete with star system diagrams, planetary surface maps, starship deck plans, and necessary structural layouts." "Far from their starting point, the explorers from Long Way Home come across a gateway, a means to get back. But sensors indicate the device is buried under a huge city which is presently gripped in the clutches of an alien war. The adventurers embark on a mission of espionage and evasion to get back to their home systems. Linked to the adventure Long Way Home, Gateway! 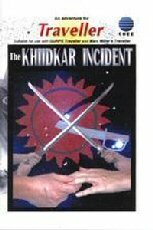 is completely self contained, a thrilling Milieu 0 adventure!" "Sign on with Captain Blackjack Tanner on his new starship, the Annililik! Its maiden voyage, however, is more dangerous than originally advertised, jumping through pirate infested systems, one step ahead of the bankers who financed its construction. Tanner is the adventurer's adventurer, pushing ship and crew to the limits for wealth and glory! 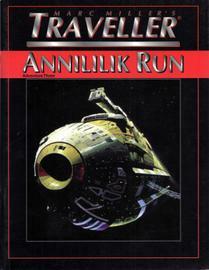 Annililik Run is a three-part adventure for any Milieu 0 Traveller campaign." "Complete charts and tables from Marc Miller's Traveller, putting details of starship encounters, combat, and more right at your fingertips during play. 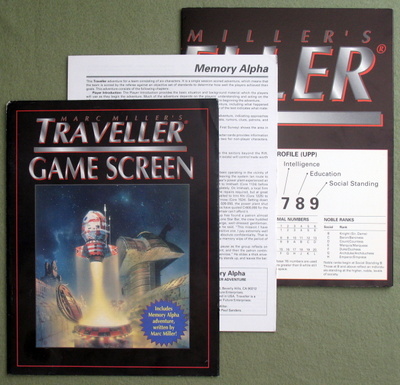 Also, play Memory Alpha, an exciting Milieu 0 adventure designed by Marc Miller. The adventurers agree to a high-paying mission with one provision: They must agree to a memory wipe on its conclusion. Before they know it, they're accepting their payment and the mission is complete, but all is not as it seems. Memory Alpha is set in Core sector." 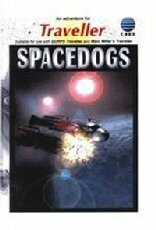 The expanding human empires reach out among the stars and make contact with two other interstellar civilizations: the Aslan, noble carnivores challenging the growth of human colonies on their frontiers; the Vargr, genetically altered savage canine stock, raiding human worlds for plunder. 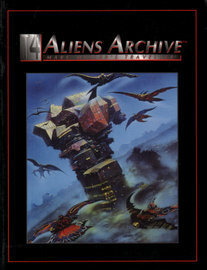 Aliens, Volume 1 presents these two major Traveller races as they never have been before. Detailed character generation is coupled with fully illustrated chapters on each race's cities, their culture, their worlds, starships, and vehicles. Both races are sufficiently described to set entire campaigns in their space, far beyond where the boldest human scouts have explored. 256-pages. Traveller's ruling classes revealed! The Imperium's noble family are gathering their power in Milieu 0, setting up the dynasties of the future. Integrate your noble character into their hierarchy and experience the benefits and responsibilities of privileged birth. Ascend through noble rank to stand at the right hand of the emperor, or fall from the inner circle and ward off challengers to your birthright. The Vilani Hypothesis insists mankind originated not on Terra, but on Vland. The adventurers are commissioned by assist a senior archaeologist in uncovering evidence to support it. But powerful forces are at work that, for whatever reason, wish the truth to remain a mystery, and they're willing to pit themselves against the archaeologist and his hapless assistants. 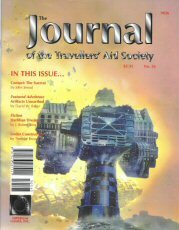 In keeping with the spirit of ignoring anything that came after Classic Traveller, Imperium Games started their "new" JTAS magazine with issue #25, where the old JTAS magazine left off, as if Challenge had never been published. 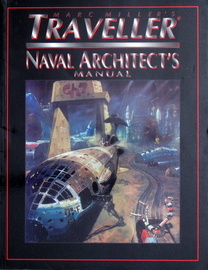 The new magazine had a brief life, as did 4th edition Traveller. 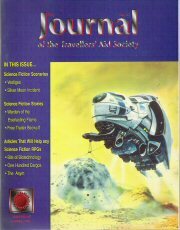 "IN THIS ISSUE... ~ Science Fiction Scenarios • Vestiges • Silver Moon Incident ~ Science Fiction Stories • Warden of the Everlasting Flame • Free Trader Beowulf ~ Articles That Will Help any Science Fiction RPGs • Bits of Biotechnology • One Hundred Cargos • The Asym"
"IN THIS ISSUE... • Contact: The Suerrat • Artifacts Unearthed (Feature Adventure) • Herlitian Dream (Fiction) • Under Construction • more. "Captain Swing is an anarchist at the forefront of the Khiidkar Freedom Front, whose cunning acts of piracy threaten the stable rule of the Imperial noble houses. Join the fight against terror... Count Julian Talaton is the sworn enemy of Captain Swing. Join this tale of noble intrigue, lost heirs, forbidden love, jealousy and experience the dangers of noble life, from a reckless hunt to the sharp end of a duel! A detailed Traveller adventure containing pregenerated noble characters, deckplans and statistics for two starships, a description of the world of Khiidkar and the Marquis' island residence, detailed non-player characters and a generic task system." 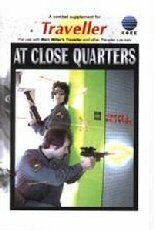 "At Close Quarters is a tactical system that emphasizes the action and reaction process of real combat. Cautious combatants with fast reactions who use all available cover will out-live reckless gun-slinger types! Add excitement to critical combat situations within your Traveller game, or use At Close Quarters for standalone ground skirmishes and starship boarding actions! Comprehensive rules for ranged combat (from aimed shots to suppression fire), melee combat, movement, action/reaction situations, types of cover (and how to reach it quickly), damage effects and healing, zero-g combat and much more. Includes extensive weapons lists and a quick-reference booklet listing all the key tables, tasks and actions." "Imperial Vargr... uplifted doggies who do the dirty jobs. They are the underclass, doomed to live and die in the slums. Little Heaven is a small colony besieged by murderous pirates. They need help - and they don't care if you've got fur and fangs if you can fight! Saving the colonists is only the first step - the struggle continues all the way to the Imperial Court. 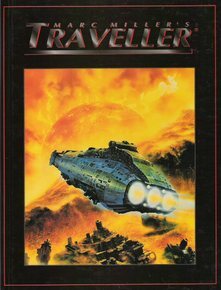 A detailed Traveller adventure containing pregenerated Vargr characters, deckplans and statistics for two starships, a description of the colony of Little Heaven, non-player characters, guidance on playing Vargr and a generic task system compatible with all versions of Traveller." "Job Advertisements... the potential for high adventure, or perhaps just another day's work. Introductions... giving contacts in important groups and corporations. Gimmicks... new toys for purchase or shipment"
"What is the meaning of life? From their first primitive ancestors to the time of the great, star-spanning Third Imperium, almost every known sophont race has developed religion. The diversity of alien species has led to an equally diverse range of religions and beliefs which can affect every aspect of a world's culture. An unwary traveller who falls foul of these beliefs may find themselves disliked, ignored, cast out or even sentenced to death! 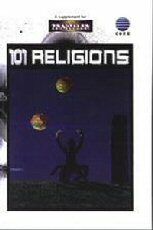 Flesh-out your Traveller worlds using the 101 religions, beliefs and cults detailed in this supplement. Every religion has player information, referee data and one or more plot ideas for creating quick-to-run adventures. The religions are grouped by IISS religion code." "Patrons always have a task that needs doing, often dangerous, sometimes illegal, occasionally heroic. But does the patron have an ulterior motive? Do the rewards match the risks? That's for the adventurers to decide. Lady Luck can sometimes throw even the best-prepared adventurers into a hazardous situation where fast thinking and decisive action is needed to save the day. 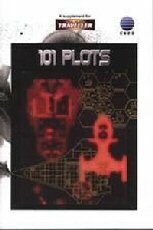 101 Patrons has a huge variety of exciting Patrons and Situations, each with multiple possible outcomes (to keep your players guessing), an index for fast plot selection, an adventure-generation system based around 36 Dramatic Situations, plus Starport Clutter, and World Secrets to add flavor to any game." 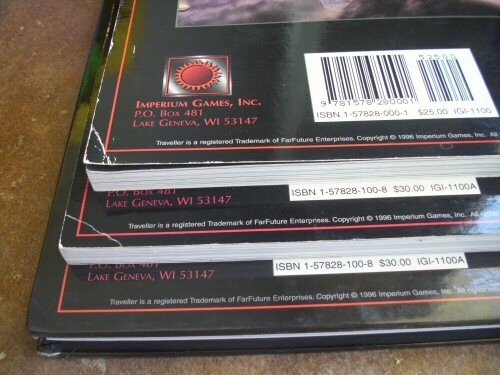 Far Future Enterprises owns (and holds trademark to) the Traveller game in all forms.